Nigeria’s Super Falcons have defeated South Africa to win the Africa Women’s Cup of Nations title. 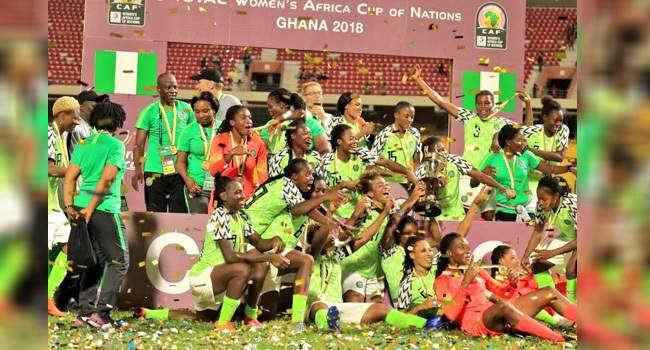 This is Nigeria’s ninth Africa Women’s Cup of Nations title, consolidating their place as the most successful team in the tournament. Saturday’s final was arguably the toughest the Falcons have played with the South African’s putting up a brave fight. As the first 90 minutes ran down with both sides failing to find the target, Nigeria was presented with a solid opportunity to take the lead when Francisca Ordega was brought down in the box and the referee awarded Nigeria a penalty. The joy that came with the sight of the referee pointing to the spot, faded shortly after as Asisat Oshoala, failed to convert the penalty. Even though both sides created chances, their failure to make them count meant that after 120 minutes, fans had to endure a tense shootout. After Onome Ebi missed Nigeria’s first penalty in the shootout, it seemed like it wasn’t going to be the Falcon’s day. They will, however, score their next four penalties, with South Africa failing twice, thanks to the heroics of Super Falcons keeper, Tochukwu Oluehi.